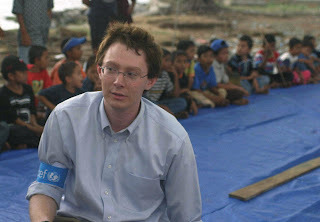 UNICEF Ambassador Clay Aiken with boy at a flood shelter, Ostuacan, Chiapas, Mexico. FUNDRAISING UPDATE: As of 2 PM PST today, more than $101,000 has been raised as a result of UNICEF Ambassador Clay Aiken's $100,000 in 10 Days for Mexican Flood Relief Campaign, exceeding the original goal! Though the goal has been reached, there is much more that can be done. remains. The deadline for the fundraiser is the end of the day today, Monday, December 31. Please act now to support recovery for children and families in Chiapas and Tabasco! Clay has spent Christmas week traveling on behalf of UNICEF in the flood-stricken regions of Chiapas and Tabasco, Mexico. Also participating in this humanitarian field visit are Clay's mother Faye and his brother Brett, a Marine on leave from Iraq. In Ostuacan, Chiapas, Clay and the Honorable Isabel Aguilera de Sabines, First Lady of the state of Chiapas, participated in games with the three hundred children in the flood shelters. Clay has spent the last two days in Tabasco's capital city of Villahermosa, visiting the largest flood shelter and meeting with the children and families residing there. Please go HERE to make a donation to help the children and families recovering from the floods. It has been nearly two months since massive flooding in the wake of Hurricane Noel displaced one million people, one third of them children. Additionally, seventy percent of the schools have been damaged and 100% of the state's crops were destroyed. In the spirit of this season of giving, please do all you can to help the children return to school and help families in Chiapas and Tabasco return to their normal lives. Please go HERE to make a secure, tax-deductible donation to UNICEF. UNICEF Ambassador Clay Aiken celebrates Christmas at a flood shelter with the children of Ostuacan, Chiapas. Last month, in the wake of Hurricane Noel, the states of Chiapas and Tabasco, Mexico suffered extensive flooding, forcing one million people from their homes. Many remain homeless and are living in UNICEF supplied shelters. Here's your chance to share the holiday spirit with children and families waiting to return to their homes and schools. Help Clay Aiken and UNICEF raise $100,000 by December 31 to help the children of Mexico! In just four days, UNICEF supporters and fans of Clay Aiken have raised $44,000 toward this goal. In the spirit of the season, please do your part to help raise $100,000 to support recovery for the children and families of Chiapas and Tabasco. I couldn’t be happier than to be with my family and UNICEF in Mexico sharing the Christmas holiday with the people of Chiapas and Tabasco who have suffered such tragedy. They have lost so much... but they have an unbelievable spirit and contagious joy. This is the holiday season and the spirit of family and giving is alive and well here. As upbeat and positive as the people are they still need our help. There is much to do to reconstruct their village and get their lives back to normal. Thank you on behalf of myself, UNICEF and the people of Chiapas for your generous donations… and if you haven’t already, please consider opening your heart to these wonderful people who have opened their hearts and homes to me. CHIAPAS, Mexico, Dec. 25 /PRNewswire/ -- UNICEF Ambassador and critically acclaimed recording artist Clay Aiken today wrapped up the first leg of his trip to the flood affected areas of southeast Mexico by participating in a gift exchange and "sing along" with over 300 children and their families at a camp erected for flood victims. Aiken, who is traveling in the region with his mother and younger brother, a Marine on leave from Iraq, will also be part of a UNICEF delegation scheduled to visit the state of Tabasco over the next two days. "The situation in Chiapas and Tabasco has really become a forgotten emergency," said the U.S. pop star who became an ambassador for the children's agency in 2004. "Telling the story of these brave people, especially the children, to a U.S. audience is the reason that I am here. Sharing this experience with my family during this time of year makes it even more special." In one weekend last month torrential rains in Tabasco and Chiapas produced the worst flooding the region has seen in more than 50 years. More than one million residents of the two states have been affected, one third of which are children. While an integrated humanitarian response lead by government and U.N. agencies has stabilized the emergency in Mexico, thousands remain homeless and displaced. According to UNICEF officials in the region, children are the most vulnerable in these situations. Hundreds of them are at risk of psychological trauma and many more are out of school due to extensive structural damage to school buildings. Today's event, also attended by Hon. Isabel Aguilera de Sabines, First Lady of the state of Chiapas, was held in the city of Ostuacan where 19 deaths were recently reported after a series of mudslides engulfed the small mountain community of Juan de Grijalva and the search for six missing residents is ongoing. Clay Aiken's $100,000 UNICEF challenge. Raise $100,000 by December 31 to help the children of Mexico! Noel: the Christmas season, literal meaning "the birth of Christ." 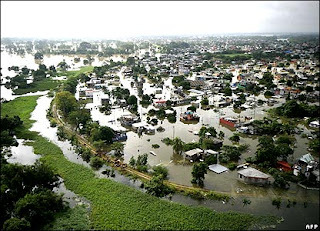 At the end of October 2007, Hurricane Noel began to batter the state of Tabasco in southeastern Mexico. After more than a week of steady, torrential rain, eighty percent of Tabasco was flooded, and more than a million people were forced from their homes. In the days following the flooding, UNICEF immediately mobilized to provide emergency supplies of food, baby formula, clean water and safe shelter for the children and families displaced by the flood. The organization is also proving thousands of recreational and school kits for children who have been displaced or whose schools have been destroyed. Two months later, in this season of noel, many remain displaced. Much more remains to be done. Now you have a chance to help those affected by the flooding in Mexico. This Christmas season, UNICEF Ambassador Clay Aiken will not be on a skiing holiday in the French alps. He won't be relaxing around the fire at his North Carolina estate. Realizing that UNICEF never takes a vacation, he has decided to spend his Christmas with the children and families displaced by the floods. He will be traveling to Mexico this weekend, at the conclusion of his fourth Christmas concert tour. In support of Clay Aiken's work on behalf of the children affected by the flooding, UNICEF has established a special donation link to challenge UNICEF supporters to raise $100,000 by the end of the year to support relief efforts in Mexico. Clay is just part of a UNICEF team giving of themselves in the spirit of the season. Richard Alleyne, a member of UNICEF's Tabasco delegation, was among the first to respond. Read Richard's Field Blog, "[In the Field] On the ground in Villahermosa, Tabasco." When I look at the first picture in this blog, I wonder who those people are and what happened to them. It could be a father and mother making way through the flood waters holding their child, as so many thousand were forced to do. This Christmas, I recognize that for some, not only is there is no room at the inn, there is no inn and no manger at all. The time is now. Before year's end, do your part to help people survive this crisis and rebuild their lives. In the spirit of this season of giving, please act now to help Clay Aiken and UNICEF raise $100,000 before the end of the year for those affected by the flooding in Mexico. We hear the same songs over and over at the holidays. They are all over the radio or on the 200th repeat of Christmas specials and so you sort of just sing along on auto-pilot. You probably sing outloud or maybe just in your head but mostly you aren't hearing the words or at least the meaning behind them. Sure, I'll remember to laugh the HAHAHA at the right time when singing about dashing through the snow but the non secular songs usually sit in my brain as simply another pretty melody. 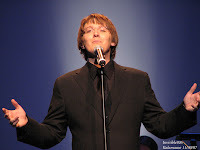 When I watch performances like Oh Holy Night from this year's Erie, PA stop along the Joyful Noise 2007 tour, I am reminded how much Clay Aiken's Christmas songs have really allowed me to connect with the words again. Perhaps it is because he connects with the music in such a way that you have no choice but to listen to the words. He turns his soul inside out and paints the words onto yours. Clay sings with his entire upper body on these songs through an oddly effective combination of movement and isolation. A good friend of mine commented that it is like he conducts himself, but I think he is conducting the words and the spirit of the song around the room. It is like it flows out of him and around him. You can almost see the words written in light, like something out of a Harry Potter movie. He's also gotten incredibly good at telling a story while he sings. Again in Albany, we saw this with a new song that I had never heard called Welcome to our World by Chris Rice. Nanjeanne often talks about the great Barbara Cook who teaches a Master's class for singers. The premise of this class is that she teaches them to sing the reality of the song. Nan posted after we returned from two Christmas concerts in New York that Barbara would be proud of what Clay achieved on those memorable nights. You know it is an incredibly moving performance when you realize you forgot to breathe and you are rendered immobile in your seat even after he has left the stage. But less I fall too far down the schmoopy hole, I find that he makes secular songs more fun too. Singing jazzy arrangements by Jesse Vargas and others, he calls on Elvis and other legends of Christmas music for inspiration. This medley gets me smiling every time. I couldn't find a video of Elvis doing it but I did find a montage with him singing in the background. They both go a-walking but Clay's winter hit the lottery since he goes a-walkin through a Winner Wonderland. Here's a partial sampling. Combining this voice with this ability to both interpret and entertain promises to be on full display in January when he starts his limited run on Broadway in Monty Python's Spamalot. Not to mention, we'll get the same hair color every night which is a Christmas miracle in itself.